​If you are unsure which program best suits your athlete(s), please contact Member Services. Our Cubs program introduces the youngest skiers to the great sport of skiing. 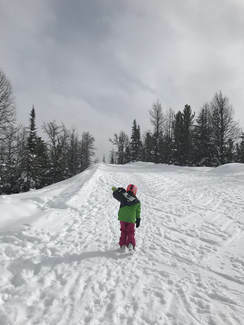 The program teaches little skiers safe and controlled skiing while instilling the FUNdamentals needed to progress in the sport. Athletes need to be skiing independently on Glacier chair before joining this program. The Cubs program begins mid-December and runs every Saturday or Sunday, with the exception of the Teachers Convention/Family Day weekend and the Easter weekend, until the end of the season. Athletes must by 5 years old (born 2013). There is limited space in the Cubs program. Please register early to ensure your athlete's spot! The Cubs program is currently full both Saturday and Sunday for the 2018-2019 year. If we have enough interest, we can look at creating another group so please email Member Services if you would like to add your athlete to the waitlist. Offered Saturdays OR Sundays, this program is for young skiers who are new to the sport and for those a little older who are not interested in a race-focused program or have other commitments. Athletes in these groups can range from 5 to 11 years of age. Regardless of where the group starts the year, they will develop the skills to ski Lake Louise’s black diamond runs. Athletes need to be comfortable on green runs and be able to load the chair with minimal assistance before joining this program. Many of our older athletes in this program will start the season comfortable on all the terrain Lake Louise has to offer. Skill development is fun for all athletes with a focus on safe, fun, free skiing. There will be some gate training but the mountain is primarily the teacher. The 17 Day Grizzlies program on Saturdays is currently full for the 2018-2019 year. I you are interested in being added to the waitlist please email Member Services. This is a great option if you want to develop a great all-round skier without a focus on ski racing. Athletes will be introduced to All Mountain skills with additional time spent on technical skill development and some gate training. These groups will participate in some club races, but will also spend time in the terrain park and learn about snow safety during the season. Athletes who want to compete will join an All Mountain group for the competition. This will allow the athletes to get a taste for the All Mountain competitive programs. This program is offered on Saturday or Sundays. A discount will be offered for registering for both days. Set training days: Saturday OR Sunday with no flexibility to switch days. ​This 35-day program starts in December with getting up close and personal with the ladies of the World Cup and never looks back! By January these athletes are skiing full-speed! There will be an emphasis on technical free skiing to develop skills, but we will also look to the great terrain of Lake Louise to teach general ski athleticism. A unique mix of gate training and drill courses that are properly timed into the mix of the free skiing will develop skills and bring ski excellence to the athletes of this program. Some training with the U10 group tops off an awesome 35-day experience for these athletes. The 35 Day program is currently full for the 2018-2019 year. If we have enough interest, we can look at creating another group so please email Member Services if you would like to add your athlete to the waitlist. ​This program enables young athletes to develop their skills in a competitive environment. It is for avid skiers born in 2011-2012 that are looking to push their skills to the next level. Athletes need to be comfortable skiing all the environment Lake Louise has to offer including the Summit Poma. 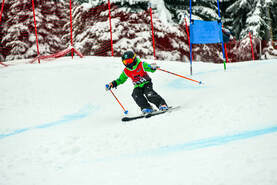 Athletes will be introduced to competitive ski racing while focusing on developing their all-round skiing skills. A typical day of training will consist of technical free skiing or gate training in the morning and free skiing the great terrain at Lake Louise in the afternoon. ​This program enables young athletes to develop their skills in a competitive environment. 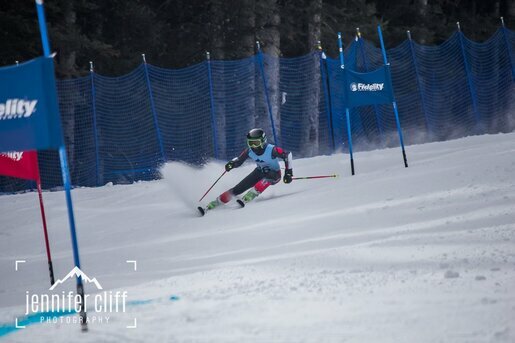 They will have a chance to compete in club events, race provincially and participate in an All Mountain event. A typical day of training will consist of technical free skiing or gate training in the morning and free skiing on the great terrain at Lake Louise in the afternoon. ​This program enables young athletes to develop their skills in a competitive environment. These athletes will have a chance to participate in club races, race provincially, try a skicross race and an All Mountain competition. A typical day of training will consist of technical free skiing or gate training in the morning and free-skiing the great terrain at Lake Louise in the afternoon. The basic program consists of weekends, Christmas camps and a spring camp, but we highly recommend that the athletes consider the extra packages to develop to their fullest potential. 2. When registering on the Zone4 website, an Alberta Alpine fee of up to $115 will be added to the program fee. This is for insurance purposes and it allows athletes to race in Alberta Alpine sanctioned races. Parents MUST be registered with Alberta Alpine so please complete the parent information section. 3. Based on registration, the LLGSC club reserves the right to combine, change or modify the programs offered. 4. Prices are current as of September 2018 and do not include Alberta Alpine fees.